I found miniature mushroom on grocery store in vegetables section. This mini size is perfect for my 2 recipes. I don’t know what kind of mushroom is this but I’m sure this one is perfect for my miniature cooking. I bought it for just 100 pesos (Philippine currency) or $2 only. Scary huh? But it’s cute! This is how it looks like, it has many sizes which is perfect in 1/3 scale and 1/12 scale of miniature food. Miniature mushroom and egg drop soup. Simple , yet delicious 🙂 You can also try this recipe in normal size of servings. 2. 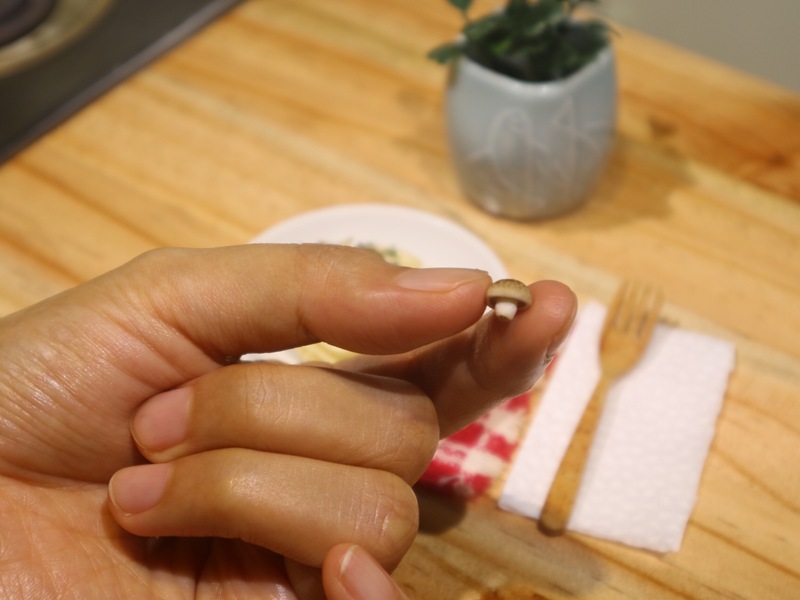 Miniature mushroom and garlic pasta. You can also try this recipe in normal size of servings. If some of you are wondering where I did get the miniature pasta. You can make your own, just like the normal size pasta you need flour, egg and salt, mix it on food processor, flatten it with rolling pin, cut it according to the size that you prefer. Hope you’ll enjoy this 2 episodes.